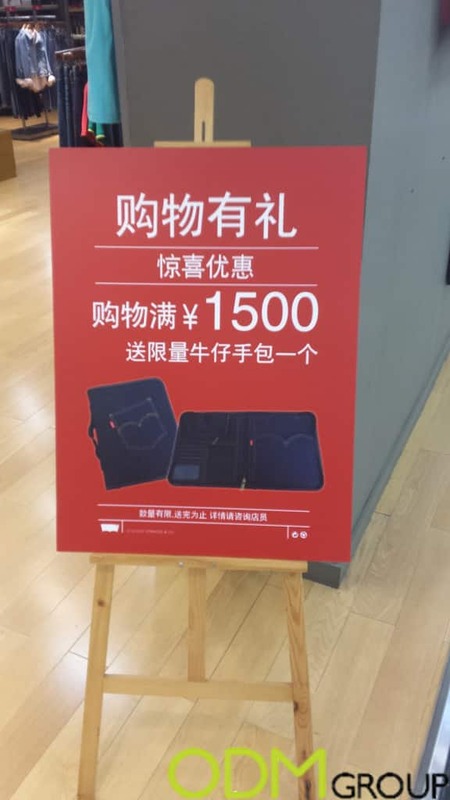 Levis in China currently have an in-store promotion. In order to qualify for this Levis GWP (gift with purchase) customers need to spend at least 1500 RMB . Levis has used an easel POS display to raise awareness of the promotion out of store. This easel is large and eye-catching so is likely to catch the attention of many passers-by. This promotional display is likely to gain the interest of the passer-by due to the Levis GWP. It may influence them to enter the store and maybe purchase some Levis products. Thus this unique POS display has converted a passer by into a customer. For more about easels as a promotional tool. After spending 1500 RMB you will receive a free gift. The free gift is a large portable case which can be used to store various belongings. The case can be unzipped. To reveal many pouches in which you can conveniently store your various bank cards, documents, etc. 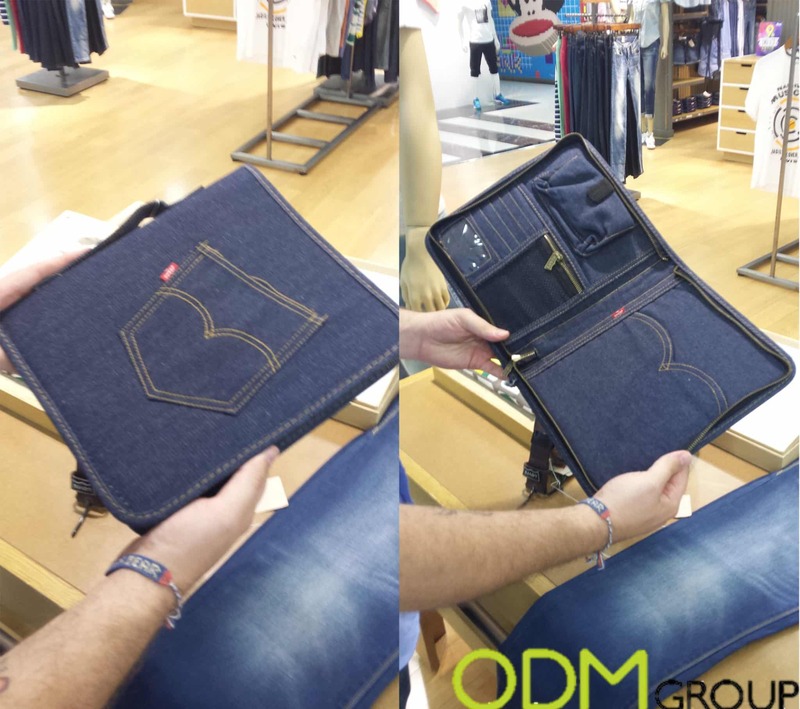 The case is also unique in design as it is made of Denim. It also has a pocket on the exterior of the case, with stitching and Levis logo. All of which are synonymous of the Denim brand. These features are likely to raise brand awareness as the Levis GWP is likely to be used continually due to the product being durable. Repetition through use will increase brand recognition. A further great aspect of this promotion. Is the ability for potential customers to be able to get a hands on experience of the Levis GWP. They are able to judge the worth of the case. This is likely to influence their purchases made in-store and whether they spend enough to qualify for the promotion. Lacoste Offers Stylish Gym Bag as Promo Gift! Captivate audience internationally with this custom case!